Never gamble with your dog. This is a lesson I recently learned the hard way. Going into it, I thought I was being so clever, but now I regret the whole thing. Just so you understand, I didn't lose Harry in a poker game, and I haven't been taking chances with his health by feeding him off-brand dog food. I don't let him play in traffic or run with scissors. I suppose it would be more accurate, rather than say don't gamble with your dog, to say don't gamble against your dog. He will win, believe me, and when he does you'll feel like a complete idiot. I should know. A couple of months back, I thought it would be really clever to enter Harry in the office hockey pool. One or two people protested and said they didn't think a dog should be eligible, like it debased the whole hockey pool process or something. The anti-dog grumbling died off pretty quickly, however, when I explained that, unlike at least one person in the office, Harry would be making his own picks. His money was as good as anybody's, I hastened to add, and would make the weekly pot bigger by a dollar. (We're not talking high stakes here - the weekly pot is only about 15 dollars, or $105 in dog money.) Besides, I argued with a carefully measured tone of scorn, he's just a dog, so it's not like he's going to beat anyone, now is it? Thanks to my masterful rhetoric, the resistance was quashed and Harry was called up to the big leagues to play with the humans. Using a numbered grid system with treats placed to represent players, Harry made his ten selections all by himself. Some were good, a lot weren't. Then it was my turn. Armed with the most up-to-date information that modern hockey journalism could provide, I brought the full force of my enormous primate brain to bear. I painstakingly made my own selections, taking into account such arcane details as overall team performance, likely linemate arrangements and other more intangible qualities. My calculations were rational and precise. Now, despite what I may have told everyone to get them to let Harry into the pool, I secretly figured at least a few people would end up behind Harry in the standings. There's a big element of luck in these things. That's why they call it gambling. Well, so far, Harry's not exactly the alpha dog of the pool. In fact, he's beating just one person. You guessed it - it's me. Anyone with even the slightest sense of irony would have seen this coming. Not me though. My biggest hope now is not that I will win the pool, but that I won't lose to my dog. While there's still a chance I may catch him, the trend is in the opposite direction. He's pulling away and I'm running out of time. It's very sad for me, but Harry just laughs his little dog laugh. Well, it was a long and gruelling season. There were more injuries than in any year I can remember. Many significant players were lost for long periods of time. There were a lot of ups and downs in the standings. Many odd and completely unpredictable events occurred. While it may sound like I'm making excuses, I'm not. I beat the little fur face. Harry was ahead of me for a long time, but I eventually caught and passed him. He did make a respectable showing, however. While the Missus and I both beat him in the final standings, Harry won more money in the weekly prizes than the two of us put together. Having a lot of odd players that nobody else picked meant that, in the weeks when the usual top scorers were off their game or injured, Harry cleaned up. His winnings have paid for quite a few dog treats and he's still got some money left. Not surprisingly, he likes the whole gambling experience. Did the experiment prove anything? It's hard to say. Harry didn't exactly dominate the standings, but on the other hand, he didn't finish far behind the main pack either. He beat one person (poor Doug) and was nipping at the heals of two others when the season ended. If nothing else, it makes you think. Or, on the other hand, maybe it doesn't. Yet another hockey season has come and gone. Harry and I once again entered the office hockey pool. We used the same method as before to make Harry's picks, and once again he got out to an early lead over me. To complicate matters, Harry was not the only quadruped in the pool this year. He had competition from a cat named Hogan. When we heard Hogan was going in the pool, we were going to protest that cats shouldn't be eligible, but we decided that might be viewed as hypocritical. It was a competitive year, with smaller than usual margins between players. Harry had a good start, owing in part to his having been lucky enough, or perhaps shrewd enough, to pick Jaromir Jagr. A lot of his other picks were less fortuitous, however. Several of Harry's players got injured early and injured often. He also had the poor judgement to pick Valeri Kamensky who, in turn, stunk early and stunk often. Maybe Harry figured that Glen Sather would be able to turn the Rangers around and provide some coat tails for the lackadaisical Russion to ride on. Who knows what he was thinking. Either way, his luck didn't last. With the smile wiped from Fortune's face, Harry's early glory quickly gave way to a prolonged slide in the standings. The cat and I both passed him. The cat, in turn, passed me and was in the top five out of 17 places for a while. I managed to stay ahead of Harry, but I was definitely not the lead dog. As the season wore on, the cat remained out in front. Harry languished in 14th or 15th position. One injury followed another. Using my great primate brain, I made Harry's two allowed trades. I got fooled by a rare burst of effort from Kamensky and failed to dump him on Harry's behalf. It was a mistake that dearly cost my poor dog. Luckily for us, however, the cat was having some troubles of his own. A rash of injuries, along with the poor judgement for which cats are known, combined to produce a claw-dragging slide in the standings. Meanwhile, Harry's injured players started to filter back. Kamensky was still as useless as ever, but Harry had enough quality picks playing well to boost him upward at just the right time. Each week he closed the gap on Hogan a little bit more. As the season drew to a close, however, Harry fell just short, finishing thirteenth to Hogan's twelfth. One more week and he'd have had him. I snuck all the way up into third place, proving that doing well in sports pools really is just a matter of luck. On the positive side, Harry beat four of 15 human competitors, which is better than 25 percent of the field. Not too shabby at all - for Harry anyway. As always, Go Dog Go! Year 3 - here we go again! Well, by now, Harry is a hockey pool veteran and his experience seems to be paying off. It's very early in the season at this point, but Harry has already taken one of the weekly pots. He's also third in the standings, behind just one human and, once again, the cat. Harry's exceptional performance has raised some ugly questions for those of us below him in the standings (all 12 of us). In times of tension, accusations invariably start to fly. Some of my fellow losers have accused me of making Harry's picks for him. I have to laugh. If I made Harry's picks for him, then you have to wonder who made my picks for me, as I seem to be way down near the bottom of the standings. If I am the hockey genius behind Harry's brilliant picks, you'd think I'd have made a few for myself, wouldn't you? You'd also have to think that some of the other geniuses in the pool would have made some brilliant picks of their own. Harry was the only one in the whole pool to predict the excellent play of Doug Weight and Ron Francis. He and the cat were the only ones to anticipate Calgary's resurgence and select Derek Morris in the defense category. Only the cat saw fit to pick Jeremy Roenick. In contrast, three human players actually picked Mario Lemieux, even though he has stated pretty plainly that he won't play more than half the Penguins' games this season. Go figure. In short, let me say again that I did not make Harry's picks for him. He picked them the same way he has the two previous years - by picking treats off a numbered board. This year I even added the extra accountability measure of having the Missus hold the selection form and write down Harry's picks while I ran the board. That way, I didn't know which numbers on the board corresponded to which players so I couldn't unconsciously influence Harry's choices (lucky for him). The Missus was also on hand to serve as a witness to the validity of the proceedings. I was inspired, right from the start, to take these measures because of accusations that Harry's selection of Jaromir Jagr the previous year was a fix. While I knew that there was no intentional subterfuge on my part, I was open to the possibility that, with his highly observant nature, Harry may have picked up an unintentional cue from me as his snout moved over Jagr. I doubt it, because he got a treat no matter what he picked, but you never know. Incidentally, it's interesting that people would suggest that Jagr wasn't a legitimate pick, but they were more than willing to accept Harry's unfortunate selection of Valeri Kamensky. Once again, go figure. Annoying as they may be, these accusations of foul play are not surprising and are understandably part of the denial that comes from losing a mental contest to a dog. It's not an easy thing for a person to accept. It raises the frightening possibility that, despite our highly evolved primate brains, we are actually all dumber than a dog. Granted, Harry is a very smart dog, but most humans would like to think that they are smarter than all dogs, everywhere, at everything, all the time. When this belief is shaken, the cognitive dissonance can have devastating effects on the psyche. Resolving this internal conflict is necessary for the preservation of our self esteem. We might suppose that the dog is not really smarter, but merely better informed. This is quite probably true, at least for some of the people in our pool. On the other hand, I haven't seen Harry doing a lot of hockey related research, but who knows how he spends his afternoons when I'm not around. Another possibility we might consider is that Harry's picks are completely random. While it eliminates the whole "dumber than a dog" aspect, it does carry the nearly as nasty implication that, by finishing below Harry in the standings, a person has actually done worse than a random, totally by chance, no-thought-involved sampling. Not much of an improvement, self esteem-wise, I'm afraid. My personal theory, knowing Harry as I do, is that, while he knows nothing about hockey, his picks were not random. Harry, you see, has powers. The longer he's in the pool, the better able he'll able to focus the mystical energies that allow him to make his picks. One more year and nobody will be able to touch him. Of course, you're probably wondering how the cat does so well, given that he's actually ahead of Harry in the standings. It's just luck, that's all. Nothing but pure dumb luck. Okay, it's been a while since I last added to this page. Originally, I planned to do an update after the All-Star break, and here it is August. There are plenty of reasons why it's taken me this long to get back to it. There are numerous factors at play. Many, many things have weighed upon my mind these past months. There's the ever-widening war on terrorism, not to mention the multi-billion-dollar scandals in business, and I'm told that the hole in the ozone layer is still there. My deep-seated concern over these important issues has naturally prevented me from devoting time to something as trivial as hockey pool results. Of course, on the other hand, it could just be because I'm embarrassed that I lost to my dog. Yup, there it is, the ugly, ugly truth. He beat me. I came in ninth out of 15, he came in eighth. The cat finished fourth and beat us both. What more can I say? Well, for one thing, I must say I'm really regretting all that stuff I wrote about fragile psyches and cognitive dissonance. It really came back and bit me in the bum, didn't it? Never, ever gamble with your dog. Have I mentioned that yet? Harry was already way out ahead of me early in the season, back when I wrote the last section, but, with my enormous primate brain (and ego to match) I figured I'd have no trouble catching him once the little statistical anomalies all worked themselves out. Some people might lose to a dog, but not me. I didn't give him enough credit, though. His winning ways carried on. By mid-November Harry had taken over first place and stayed there unchallenged for several weeks. He'd have won quite a few weekly pots if not for the way that trades are handled in our pool. Under our rules, when you trade a struggling player for a streaking one, all his points are added at once, making for a big boost and practically guaranteeing you'll win the weekly pot. So, as the people below him in the standings made their trades, Harry lost out in the weekly pots, despite remaining near the top in the standings. I was pretty proud of him. I found it pretty amusing that everyone was losing to my dog. His success distracted me from my own back-and-forth battle for last place. But, as our Christmas trade deadline neared, Harry's luck was starting to fade and he had just one trade that could help him. The previously streaking Derek Morris had gone down with a longterm injury, leaving Harry a player short. We traded him away for Ottawa's Wade Redden. The gain in points wasn't enough to give Harry the win for the week, but at least Redden was contributing regularly. When play resumed after the Christmas break, Harry started to drop in the standings. By the All-Star break he was down to fourth, but still in striking distance of the top three money-winning spots. He had a few good weeks here and there, and tied for a weekly win, sharing the pot with Hogan the cat. Most omens go unnoticed, except in hindsight. This was no exception. That shared pot was the beginning of a massive upsurge in Hogan's fortunes. I may have failed to notice the portents of doom for Harry because I was too busy celebrating my own upsurge as I climbed out of my battle for last spot into solid possession of the 13th position. The cat, of course, was well ahead of me the whole time. Gradually, he passed Harry too. Hogan continued to climb and, had there been one more week of play, I'm quite sure he would have caught his owner too, and taken third-place money. Another week wouldn't have helped me catch Harry though. While there was only one place between us in the standings, there was a big gap between us in points. He beat me, fair and square. No replay needed. So then, what have we learned from all this? Well, I for one have learned nothing at all, as is my custom. Nothing takes the fun out of life like learning from your mistakes. In keeping with this philosophy, Harry and I will both be entering the pool next year. Maybe I'll beat him, maybe he'll beat me. In either case, the pressure and tension are gone. I think by this point we've proved that it's not a game of skill or knowledge. It's all about luck. It's really no different, say, than a lottery. Year 4 . . . and a small dog shall lead them. An entire year has passed since I last updated this page. Harry and I both entered the pool again, 30 professional hockey teams played 82 games apiece, the results have been tabulated and . . .
. . . Harry won. I kid you not, he won. He won the whole pool too - the final big prize, not just the weekly pot. He came silently from behind, beat us all and left us shaking our heads in disbelief. To be honest, after last year's relative success, I wasn't even going to bother writing an account of this year's pool because, if you hadn't noticed or were just too polite to say anything, this page has gotten awfully long. After the 3,000 or so words I'd already written, I didn't really think there was anything more to be said on the subject, but Harry winning naturally changed my mind. It's a unique experience to be beaten by a dog in a game of wits. Okay, maybe it's not that unique, seeing as there are 13 of us in the office who had that experience this year. For the most part,though, people don't expect this sort of thing to happen in the allegedly rational world we live in. We like to think we're dramatically smarter than dogs. It seems a reasonable assumption, and furthermore, it's supported by objective scientific testing. Get your dog to take the SATs, for example, and chances are he'll do no better than low 600s. I've come to realize, however, that the reason dogs don't do well on standardized testing, apart from the obvious cultural biases, is that they just aren't trying. You can't get them to study and they typically wander off as soon as you turn your back. To their credit, dogs just don't get excited about this sort of thing. They have different priorities and they just don't seem to care about the same things we do. They're happy to let us be better at the things they find foolish. When they do try, though, they usually beat us. Think about this for a second and you'll see that I'm right. The only things we can do better than dogs are the things that dogs don't care to do anyway. We might be better computer programmers, for example, but can we herd sheep? My grammar is better than Harry's but he's a much better ball player. I could probably beat him at chess, but he's smart enough to know that chess really isn't any fun. 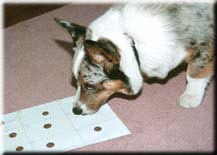 For a practical head-to-head test, have someone put a single cheese puff anywhere in the room and see who finds it first, you or your dog. It's all about motivation. Clearly, if my second-rate primate brain has correctly analysed the evidence, Harry won the pool this year because he decided to. He finally lifted his head long enough to observe the function of money and its importance in the acquisition of snacks and bones. He then brought his enormous canine intellect to bear, embarrassed us all and took our money. Now he's sitting, there perusing the collection of fine chewables he had me buy with his winnings, and he's laughing his little dog laugh. Year five's update isn't going to take long to write. There is no year five. Harry's win scared all the humans away and the pool was cancelled due to lack of interest. On the bright side, that does leave Harry as the reigning champion for at least another year. It also provides much needed closure for this page, for which by now I think we're all grateful. Harry, on the other hand, is finally starting to run low on snack money and is looking for new marks to bilk. I wouldn't be surprised to find him reading the racing forms or hiding a deck of cards in amongst the bones. He'll do well, I'm sure. There's a human born every minute.